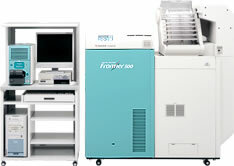 The compact, space-saving Fujifilm Frontier 500 Digital Lab System offers an affordable way to launch a digital camera print processing business. And with its high-speed, high-capacity performance, the Frontier 500 can keep up with rapidly growing demand. Achieving new savings in energy consumption, the Frontier 500 makes it easier than ever to offer high-quality digital camera print services. The Frontier 500 is the optimum entry-level model for anyone interested in starting a digital camera print business. PAPER WIDTHS 3.5", 4", 5", 6", 8"
PAPER SIZES 3.5" x 5" -- 8" x 12"